Butternut squash already has such a sweet and rich taste to it so when mixed with other flavors, this winter fruit really is enhanced and makes for a show stopping side dish! 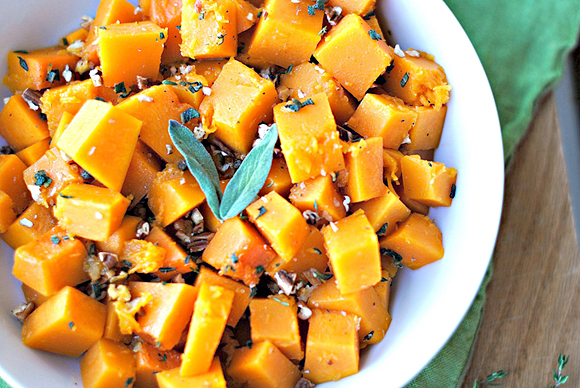 In a large 12-inch nonstick skillet, toss together butternut squash, apple cider, water, honey, sugar, salt and pepper. Bring to just a boil, then cover and reduce heat allowing everything to simmer for about 25 minutes, stirring occasionally. Uncover and cook an additional 5 minutes until liquid has thickened and the squash is tender. Pour mixture into a large bowl and add chopped pecans, sage and thyme. Mix together and serve immediately. Enjoy! Could use sweet yams for this or combination of both. If following weight watchers + this recipe is worth 5 pts.